NYCC 2018: DC announces Wonder Comics, new imprint with Bendis at the helm – AiPT! Young Justice, Connor Kent, Teen Lantern and more. DC Comics has officially announced Wonder Comics, a new imprint under the leadership of writer Brian Michael Bendis. The announcement came at New York Comic Con during DC’s meet the publisher’s panel, where Bendis was a surprise unannounced guest. “Wonder Comics celebrates the wonder of life, the moments where you discover who you’re going to be, discover the family you grow up with and what you’re willing to fight for,” said Bendis. 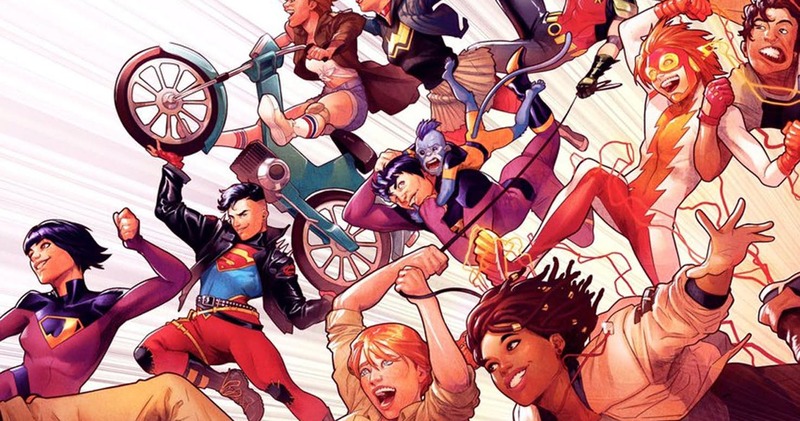 An image shared during the panel showed some of the young heroes fans will be seeing: (Superboy) Connor Kent, Impulse (Bart Allen), Robin (Tim Drake), the Wonder Twins, Monkey and more. These heroes will make up the core of a brand new fully revamped Young Justice team. “People have been asking for them over and over again, but we don’t want to bring them back and have nothing to do with them. It wasn’t until Brian came back and said he’d like to work on Young Justice that we decided the time was right to bring these characters back,” said DC Comics co-publisher Dan Didio on the Young Justice team. Naomi is a brand-new character created by Bendis and David Walker (Cyborg), with art by Jamal Campbell (Justice League of America: Vixen). “This is an opportunity for me to dig into themes I was already exploring with Miles Morales,” Bendis said of Naomi. The first love, first break up, first wins, the moments in a young person’s life when you’re most emotional and those are the most powerful. All the big firsts. Another new character coming to Wonder Comics is Ginny Hex, Jonah Hex’s great-great-great granddaughter. Ginny has no idea of her lineage and it’s thrust upon her when she discovers a strange ray gun. Ginny Hex’s debut will be in the next Walmart Batman issue. Teen Lantern is another new hero who will be joining the ranks of Young Justice. She’s a young woman from Bolivia, whose figured out a way to hack a Green Lantern power battery. She really shouldn’t be doing what she’s doing and her story will eventually link up with Grant Morrison’s The Green Lanternstory. The first Wonder Comics books hit the stands in January 2019.